The scene of bomb blast in the Philippines town of Isulan on Tuesday. 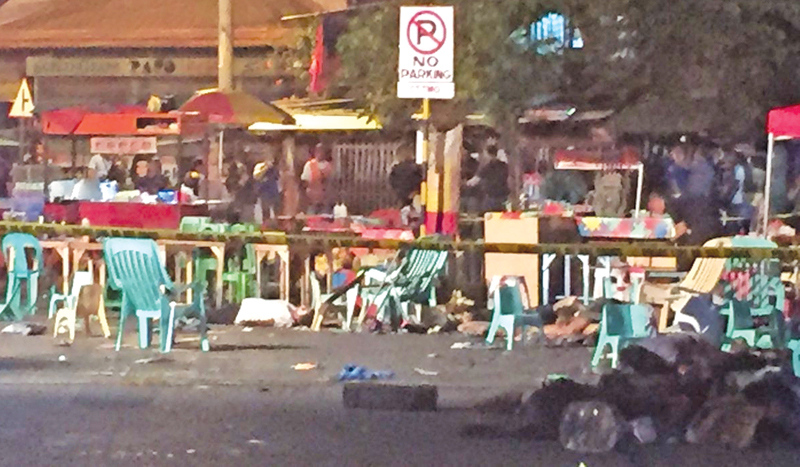 THE PHILIPPINES: Philippine authorities were hunting on Wednesday two men believed to have planted the explosives that killed two people, including a young girl, at a festival in the nation’s south. The blast late Tuesday in the town of Isulan, which wounded 35 others, is the second deadly bombing in less than in a month in the region where Islamist militants have waged a decades-long insurgency. A man left the improvised bomb in a bag near a grocery store as crowds gathered to celebrate the town’s founding anniversary but he and an accomplice escaped, the military said. “One (man) did the emplacement while the other one (drove) the getaway motorcycle,” Brigadier General Cirilito Sobejana told AFP, adding a manhunt was underway. The attack, claimed by the Islamic State group, is the latest violence in the south of the mainly Catholic archipelago where a long-running Islamist insurgency has left more than 100,000 people dead by government count. Sobejana said it was “highly likely” that the pro-IS Bangsamoro Islamic Freedom Fighters (BIFF) plotted the bombing. A military spokesman said the blast could have been in retaliation for offensives against the BIFF, adding the group had planned bomb attacks in parts of the southern region of Mindanao. “They want to create and sow terror in the area,” regional military spokesman Captain Arvin Encinas told AFP, adding two soldiers were among the wounded. The attack comes less than a month after a van bomb ripped through a military checkpoint on the neighbouring island of Basilan on July 31, killing 10 people. IS claimed responsibility for that bombing as well and authorities believe the man behind the wheel of the explosives-laden van may have intended to target a nearby children’s parade. President Rodrigo Duterte put Mindanao under martial rule until the end of this year after pro-IS militants seized the southern city of Marawi last year. On Wednesday, Duterte’s aides condemned the bombing saying it could prompt the President to extend martial law in the area. The recent blasts follow the Duterte government enacting a law to create greater autonomy for the Muslim minority in the south and which is hoped will help end the conflict. The mother of the girl who died in Tuesday’s bombing pleaded with authorities for justice.